Tucked away in the corner of September 30th’s editorial page in The New York Times rests a short letter to the editor sent in by Claudia Couch of Florham Park, New Jersey. In the letter she refers us to an article about the disappearing practice of offering a condemned man or woman a last meal of choice. 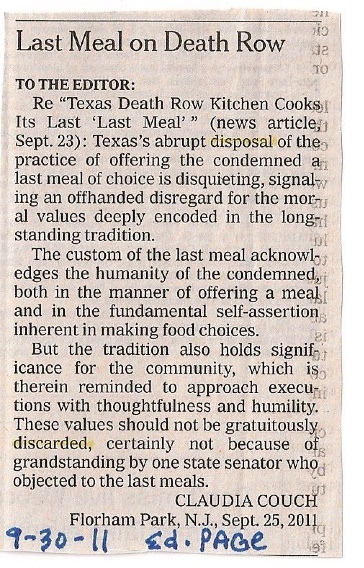 Essentially, in Texas, the practice of offering last meal choices to people awaiting execution is ending — the state will no longer be preparing chicken fried steak, fajitas, or pizza (or all of these at once) to those about to receive their lethal injections. Values, like the norms and social practices that reflect them, rest at the heart of a society. 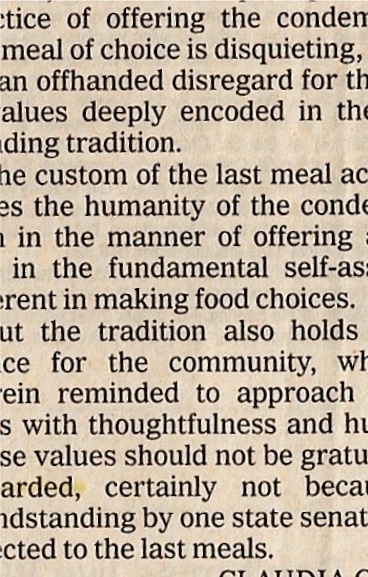 Couch is asking us to reflect upon this change occurring in Texas, to see its significance for our larger society, to consider who we are if we cannot provide a meal of choice to condemned human beings. She appropriately uses the language of disposability to challenge that disposability. We need to be careful, especially in heavily-politicized moments, that we are not careless about our values. Before we wish away a practice that speaks to our core values, before we discard this last human gesture in an otherwise draconian practice, we should pause to ask ourselves what kind of people we want to be.